UNION, Kentucky – The Conner Cougars won the Class 6A, District 5 title by defeating the Cooper Jaguars 19-14 on Friday night in Union. Cooper set the tone in the game early and opened up a 14-point lead, before eventually allowing Conner to come with 19 unanswered points. 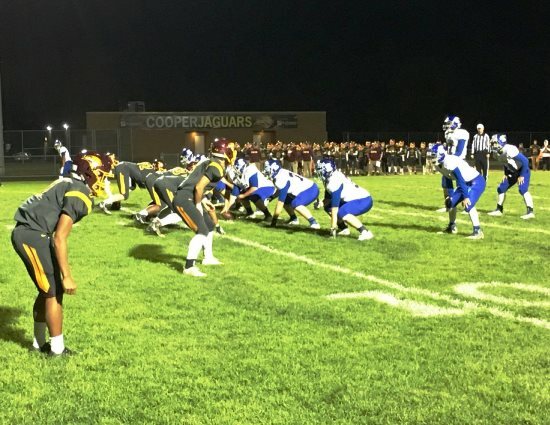 Sophomore Jeremiah Lee scored on a 36-yard run in the opening frame to kick off the scoring and then he returned a fumble on defense from 12-yards out early in the second quarter to give the Jaguars a two-touchdown advantage. The Cougars would get on the scoreboard before the half though when Lee was picked off by senior Tate Niederman, who returned it 70 yards for a touchdown. Cooper led 14-7 at the break. Junior quarterback Jared Hicks rushed for a 13-yard TD in the third quarter, but the kick failed and left Conner trailing by one as the fourth quarter began. However, it would be long before senior Christian Webster gave the Cougars the lead for good when he plunged in a run from one yard out. Webster finished the night with 113 yards and a touchdown on 21 attempts. Hicks only completed 6 of 17 passes for 37 yards, but did rush for 78 yards and a score on nine carries.